Life and summer and perfect weather and kids going to bed late and too much work for Tim have gotten in the way of bike blogging these past few weeks. We figure it’s summer and the kids are out of school and we’re free and easy to go where we want, when we want and we’d much rather be outside riding than sitting in front of the computer prattling on about riding. A long winded explanation excuse for why we’ve been lame bloggers these past few weeks. We have a lot of experiences stacked up to share with you–they will most likely trickle in this fall when the weather turns and we’re hunkered down inside. There you go, all the excuses we could muster for now. Now – Look how casual. Anyway, it’s been a whole year since we got the Xtracycles built up and started riding them everywhere. It’s hard to believe we began this bikes–all–the–time adventure a year ago. Although this was not a year long experiment for us, we fully intend to keep going, it’s fun to reminisce about the past year and reflect on how much we have changed and learned. When we’re out and about doing our thing on the Xtracycles, people often stop to chat about the bikes. (All you Xtracycle riders out there are no doubt familiar with that experience). Can kids ride back there. etc. etc. Along with the normal run through of the bike and how it works, Anne usually also shares how much the Xtracycles have changed her life. We know, some people probably think of us as that crazy Xtracycle fanatic couple and a life changing bike sounds sort of new agey and trite. But it’s completely true. Since we began riding the Xtracycles, we’ve completely changed the way we function as a family. Just last summer, Anne drove the kids to swimming lessons every day–a mere 15 blocks away. Sometimes we drove to Zoka to get coffee, just 8 blocks away. Before the Xtracycles, we didn’t have an easy way to carry kids and stuff. The kids didn’t fit in the bike trailer anymore and pulling it with two large kids was pretty miserable for all. The kids wouldn’t walk very far so that wasn’t a good option for every day transport. They couldn’t ride their own bikes more than a block. And neither of us likes waiting for and riding on busses all that much. Then we got the Xtrcycles and everything changed. Over the course of this year, we have completely embraced bikes as a simple and efficient mode of transport. We now ride bikes to get where we need to go 95 % of the time. Rain, snow, wind, hot sun-we’re out there riding. To school, to the store, to soccer, to work, to swimming lessons, on dates, we ride. We’ve had a lot of fun, met some new people and enjoyed some laughs. We’ve taught our kids to ride and inspired a few people to join us. We still have a car, but rarely drive it. We mostly drive it to get out of town or to go somewhere that’s farther than our normal 3-5 mile radius on bikes. It’s been a great year. We’re looking forward to many more. We’ve enjoyed meeting new people both virtually and in person. We get excited when we see more people going about their business and taking care of daily transport needs on bikes. We have hope that more people will join us and discover the joy and ease of using a bike as transportation. Thanks for all of your support and interest in our adventure! This entry was posted in alternative transportation, bigger than here, bikes, kids, sustainability, xtracycle and tagged alternative transportation, bikes, xtracycle. Bookmark the permalink. My wife and I saw our first Xtracycle in Santa Monica in 2004, and we were both in awe, but hadn’t quite gotten to the “that’s in our near future” state of mind about it at the time. I think it was shortly after I sent her a link to this site last fall/winter that we started doing math and planning to make it happen. I think we’ve put all of about 1,500-2,000 miles on the car since February, and there’s at least 3 trips from DC to NYC and back in there. I’m building our second Xtracycle now from an early 90’s lugged-steel Trek 930 frame we picked up on eBay. It’s gorgeous. The Soob, despite having been very good to our family, is being listed on Craigslist. We’re just not using it enough to justify the expense. Now, I’m not saying, necessarily, that it was your blog that set all this in motion, but I’d say without reservation that it helped push in the right direction at the right time, and we’ve sure enjoyed your dispatches. Y’all are awesome, thanks for bloggin’ about it. chiggins — thanks so much. We’ve always said we’re just some folks ridin’ some bikes and if people wanna take that as a good example, then we don’t have a problem with it. BTW, my web reading has been in the toilet of late, but I’m a big fan of your blog. I love how you mix it up. And you are right, those lugged Treks are sweet. I had an old 531 600-series touring bike that I bought new. I sold it, get this, for a first-generation Cannondale road bike. Oh, how I have changed! Great Site. I was wondering what break shifter set up was on Ann’s bike. Did you already have the breaks and shifters or did you purchase them specifically for the A-bars. If you bought them from where? Thankya kindly! That’s always a nice thing to hear. I can relate to the inadvertent sale of good things. Back in ’92 (when, incidentally, I did some messenging for Elliot Bay Messengers), I bought a 970, lugged frame in that General Lee red-orange. About two years later, having returned to Ventura, I sold it for cash and a Raleigh road bike. A few years later (’95 I think?) I traded a Nikon FE2 body, MD12 motor drive, and 3 lenses for 32 megs of ram. Those were the Years of Making Bad Deals. I’m feeling much better now, though. Happy anniversary, Carfree Days! You guys inspired me to finally pull the trigger on an Xtracycle kit, too, and I was recently able to sell my unused motor vehicle and use that money for some house projects (super-insulating the attic, some landscaping and some bill paying). We’re “car-lite” but not completely car-free. Here’s to another great year — I look forward to all of your updates, tips, tricks, travels and all that other stuff you do via bicycle. Yea for your year anniversary! We have had our xtracycle for almost 4 months now and no longer have a car. It’s hard to remember what life was like without it! My husband and I have been enjoying your blog for a couple of months now, it is so great to see other people enjoying riding their bikes! Ghostrider – Thanks! I’m glad you sold your car. Tim and I justify all sorts of purchases (mostly bike stuff and gear) because we have only one car. But insulation and bill paying works too. Krysta – Thanks for the comment. I’m glad you’re loving your Xtracycle. Don’t worry, Anne…I splurged on a couple of bike goodies (a pair of handbuilt wheels on vintage Campagnolo hubs from Peter White Cycles of NH, and a really cool “Cars R Coffins” jersey from the good folks in Minneapolis. I haven’t missed that car ONCE! well, I’ve been biking myself and my 2 year old around for a while (since January) and don’t ever want to go back to driving. The only thing is, now I need to get an 8 year old to and from my work/his school, 7 miles from our home. I plan to buy an Xtracylce to do the actual commuting, but I’m curious about how you got your kids to ride in the rain. Did you outfit them in anything more than a rain jacket? I’d love any advice you might have re: rain and children. Glad to hear you’re addicted to riding. Keep it up. Will your son be riding his own bike? 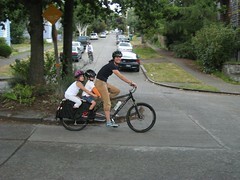 Or riding on the Xtracycle? If on his own bike, fenders are a must. Tim is currently looking for the perfect fender option for our 7 year old’s bike. I’ll keep you updated when it’s ready to go. (or he’ll probably just post about it) We also realized our kids need lights on their bikes. As far as clothing goes – wool is totally worth the investment. We got both of our kids Smartwool baselayers and socks last winter. It stays dry and warm when wet. They also wear gloves and thin hats under their helmets. Rain ponchos are great too. They never complained about being wet or cold last winter. I also pack hot chocolate in a thermos when it’s really cold – helps keep them motivated. It’s hard to talk about winter when the weather is still so nice!